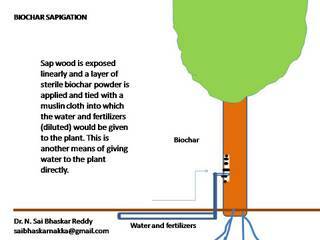 Perchigation is a means of creating a shallow aquifer using biochar for irrigation. It is highly suitable for semi-arid and arid areas to prevent evaporation of water. 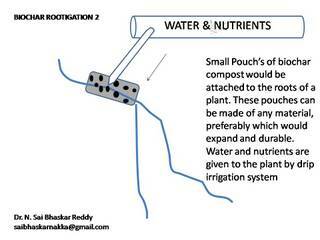 Prevent water going deeper into the aquifers there by the ultimate water reaching the plants is limited. Some of the advantages in this system. 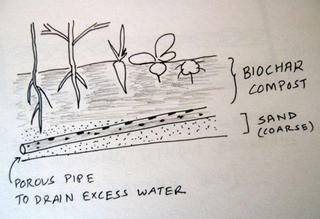 Biochar would absorb the water and other soil nutrients from losses. 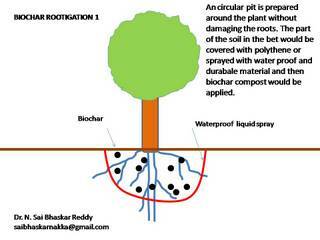 The rainwater is harvested in the ‘biochar aquifer’ created. The water can be recycled through recovery. The water gets purified due to biochar in the areas where polluted water is used for irrigation. Highly suitable for the cultivation of vegetables, tubers, cereals, chillies, cotton, etc. 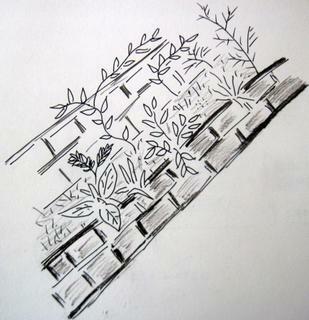 Suitable for adoption in the fields, green houses, polyhouses, etc. The Soil Fertility Project is an interesting project that attempts to use biochar to address soil fertility and climate change both in Wales in weed eradication projects. 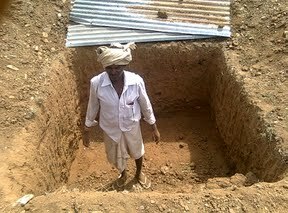 In the Indian project ( http://www.soilfertilityproject.com/Soil_Fertility/Indian_Project.html). The participants started by using the Anila stove to product biochar, but found that it was unworkable. Now they are using a digestor to process wet waste, get some energy, and use the slurry for fertilizer. They are also using a small BiG Char unit to process green waste into biochar. 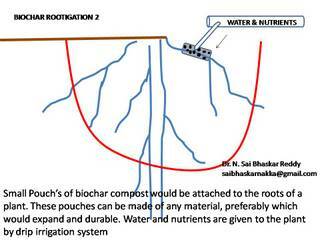 In this methods are explored for giving water and other inputs through use of biochar. Some of these methods are being applied in the field for mango plantation. 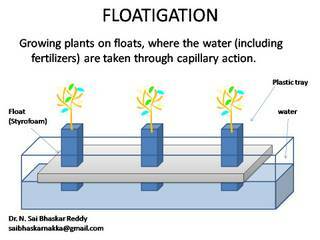 Floatigation methods are being applied for poly houses. 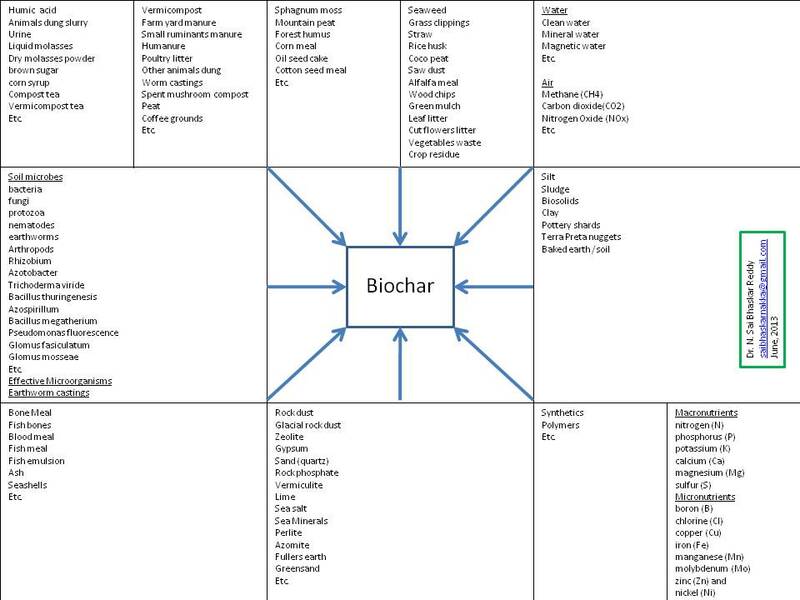 Biochar compost is an excellent media for all kinds of applications. 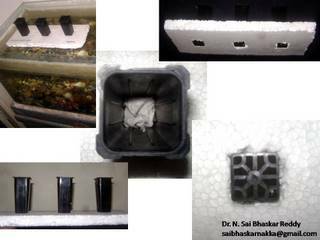 Recently I had been experimenting using biochar compost for mobile gardens and floating gardens. Although here it is used on a small scale, it could be used for large scale applications too. 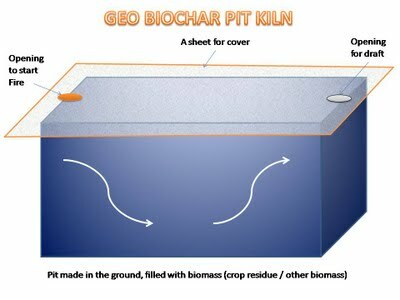 BIOCHAR PIT KILN is one of the simplest method of converting the crop residue and other biomass into Biochar / charcoal http://geo-biocharkiln.blogspot.com/. 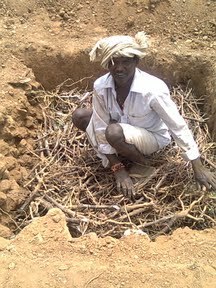 The farmers can easily create pits / trenches and convert the biomass residue (apart from using for compost, mulch, etc) otherwise wasted by burning in the fields openly. 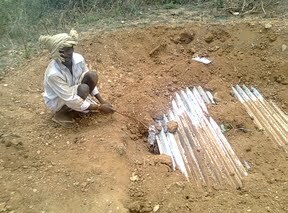 The tribals at Yerragondapalem (supported by NABARD / Sri Sai Educational Society), in Andhra Pradesh were trained in this method (GSBC Project), they are able to produce the biochar, preparing biochar compost and applying to their fields.